Several weeks ago I had received a call from a good friend of mine who kindly invited Lindsey, Marley, Buddy and I to spend the weekend on one of the farms he frequents. This was an excellent opportunity for us as we had just recently purchased an R/V for extended trips and to make room for our new larger dog Buddy. Friday afternoon I loaded up the R/V with all of my camera equipment, Airguns and gear so we could get started on the road early Saturday morning. My friend had informed me that the Ground Squirrels and Collared Doves were plentiful and ready to be thinned out a bit. Saturday morning we left the house for our several hour trip down to the farm, the weather was a bit chilly but bright and clear. We arrived to the farm by 9:00 and were kindly greeted by the farms owner. We drove in slowly as the road was still a bit muddy from the several days of rain we had had. All the rain has turned the hills grass so green, something I have not seen in many years. This farm has many acres of prime huntable land that offers a great place to target shoot as well. The panoramic views were just gorgeous with the green grass and snow capped mountains in the background. I had brought several Airguns with me but had planned to use my American Air Arms EVOL .30 for most of the weekends hunting. I started off the day by unpacking the gear from the motorhome and to situate it for the several days of being parked. After setting things up I was eager to set out on foot and have a look at the property as well as the varmint activity. As we made way down an animal trail that weaved through the many fallen citrus trees I noticed a ton of Rabbit and Ground Squirrel activity. 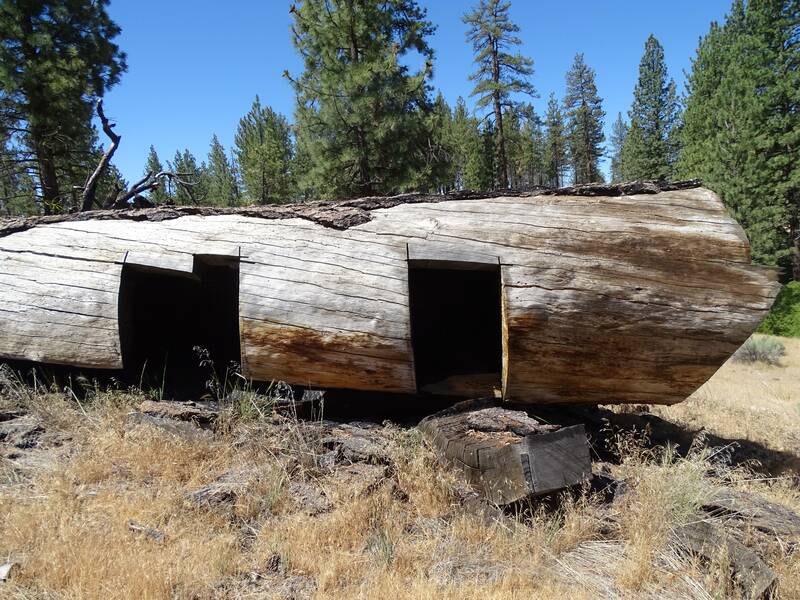 This trail made way around the property and ultimately led up to a small abandoned shack. This shack was a great place to stay hidden from the many Eurasian Collared Doves that flock into the branches of the fallen citrus trees. I set myself up inside towards the back wall that left me some great shots between 20 and 60 yards. After waiting for several minutes sure enough a good size flock of Eurasians came in to perch on the branches just ahead of me. The Eurasian Collared Doves are becoming more and more abundant here in the Western states and can be found near almost all agricultural properties. In many cases the populations have simply become far out of control and at times may need to be thinned out. No species of bird has colonized North America at the speed with which the Eurasian Collared-Dove (Streptopelia decaocto) has marched across the continent. Many invasive species have a negative impact on native species, particularly species that are similar to the invader. Eurasian Collared Doves can be easily identified by the black ring that goes from the back of the neck and stops halfway around the front with a sharp taper. Most states have no limit on these invasive species and are in some cases encouraged to be taken. Air Rifles are near the perfect tool to ethically hunt the Eurasian Collared Doves, especially in a farmyard type environment. 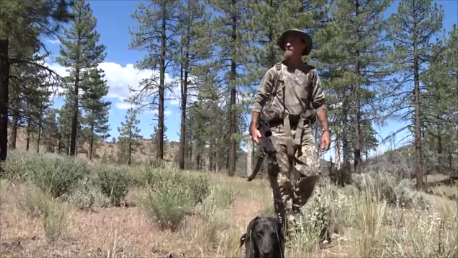 When hunting on any permission it’s imperative to be safe and know your surroundings. Under some circumstances the use of a large caliber may be a poor safety choice. When hunting birds we are most likely always aiming upwards and sometimes near buildings or livestock. We always need to be aware of what’s behind our line of sight and to be conscious of the surrounding areas. Over the next few hours I had some great success with taking many Collared Doves and ranges out to 60+ yards. My rifle is outfitted with a DonnyFL Ronin moderator that quiets the report down considerably making the birds a lot less skittish to land. Many of the times I was able to take several sitting on the same branch. The fallen citrus trees had many California Ground Squirrels that burrow in and around these areas. Marley and I spent enough time on the birds so we headed back to the motorhome for some lunch and a bit of relaxation. This area was a pleasure to hunt and definitely had given me the most fun I’ve had hunting birds in a great many years. After lunch I topped off the EVOL with air and filled my bag with some more NSA .300 47gr hollow point slugs. I have used these slugs for the majority of the hunting I do here in CA as they’re extremely accurate and carry much better BC than that of a standard diabolo pellet. 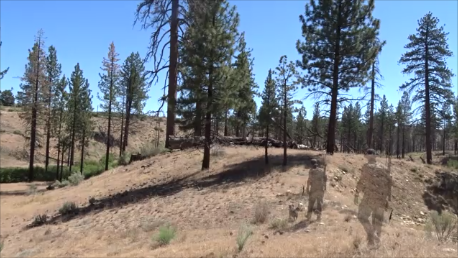 After reloading my pack and putting a fresh battery in my camera Marley and I set out again, this time we were going after the California Ground Squirrel. This farm has several large pastures that are bordered by some large citrus groves. When Springtime comes the Ground Squirrels move into the groves and cause serious damage to the orange trees, killing many of them. Our goal was to eliminate some of the larger adults before having a chance to create offspring that can explode the population in less than several weeks. I walked around the property and noticed quite a few large adults in an area approximately 40 yards from the edge of the citrus grove. These areas all had very large mounds with active holes set several feet apart. Marley and I set up on the very edge of the northern part of the field between 65 and 100 yards of most of the active holes. 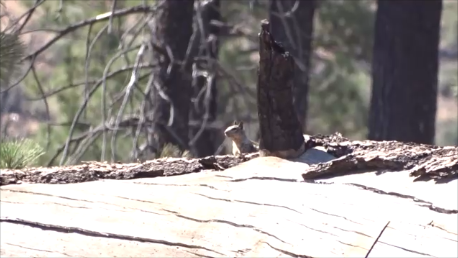 In most cases hunting Ground Squirrels requires a good amount of patience and quiet time. When hunting like this we sometimes may be waiting 20 minutes before we get a good clear shot. After a short wait I spotted several large adults congregating just outside one of the large mounds at 67 yards. 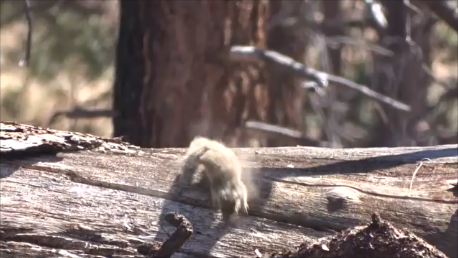 With careful aim I was able to take a great headshot that threw the Ground Squirrel down lifelessly. A short time later I spotted another one at 72 yards and was able to take it down with another perfectly placed headshot. This field looked to be pretty active but after killing several off they became extremely skittish and stopped coming out. At this time I decided to move a bit higher up on the hill where I could get more of a long range view of the field. This hill gave me a great view but took me out of the shelter of the wind. The next adult ground squirrel was across a ravine at 112 yards, somewhat of a tricky shot in heavy wind. I took the shot and was a bit low hitting it in the shoulder sending it into a flip. Not much can survive a shot like that and sure enough Marley found the squirrel expired just under a nearby bush. After several hours of some casual pest control we headed back to the motorhome to relax and to take a short walk with the dogs. That evening my friend and I had planned to take a trip out for some rabbits, skunks and coyotes. After having a nice relaxing dinner in the warmth of the motorhome my good friend and I got ready for a night hunt. I would be using the GAMO TC45 loaded with 138gr Air Venturi diabolo pellets. This is a rifle I have been working with for several months doing and in depth review on. I have found it to be an excellent short range big bore that’s an excellent choice for small to medium game. This rifle is easy to carry and with the Trinity Force 1-4X28 scope I’m able to mount a light very easily onto the tactical rail. This area gets very cold at night so we quickly found that most battery powered devices lose power due to the low temperatures. This evening I was hoping to spot one of many coyotes that frequently roam throughout the farm looking for rabbits as well as trying to enter a nearby chicken pen. Due to the cold we called the night short but not before I was able to take several cottontails moving about through the thick areas of a large field. The following morning I got up fairly early to head out to film some shots for the enclosed video. Over the next year I plan to do add some more hunts like this into the “Farm Series” of videos. This has been a great experience for me and was happy to have the opportunity to try something new. Most of my hunting is done in very remote and hard to reach natural terrain, this has opened my eyes to a different form of hunting. I was happy to have put a dent in the pest populations on this farm as well as opening the door to future visits. I apologize for the short post but have found it to be increasingly difficult to produce both videos and written reports together. Over the past several months I have been working on several amazing projects with some very interesting Airguns that will be shared very soon. Enclosed is the video I hope you may enjoy!! Dana Webb and I met for a much needed Airgun Adventure. The plan was to meet early in the morning at the crossroads leading into our location and caravan through the back roads to our spot. As with many plans, they don’t always go as anticipated. Dana and I both had some unexpected home duties to perform before leaving in the morning, even though we didn’t get to our meeting spot until well after lunch; I knew, once we arrived life would be good. The location was high in the Mojave desert against the foothills of the Sierra Nevada; very remote, quiet, and beautiful. This spot is not unlike so many other special places which have extremely diverse terrain. There are Joshua tree forests, rock outcroppings, sandy arroyos, typical desert chaparral and the occasional juniper tree. It was only two days after some very significant rain had hit the area, leaving the ground damp and dust free with most of the vegetation temporarily moistened leaving that wonderful after-rain scent in the air. Upon arriving to our campsite, the hunt was on. As usual when hunting with Dana, he spotted the first jackrabbit and we both took a few shot as it fleed up a small hill. 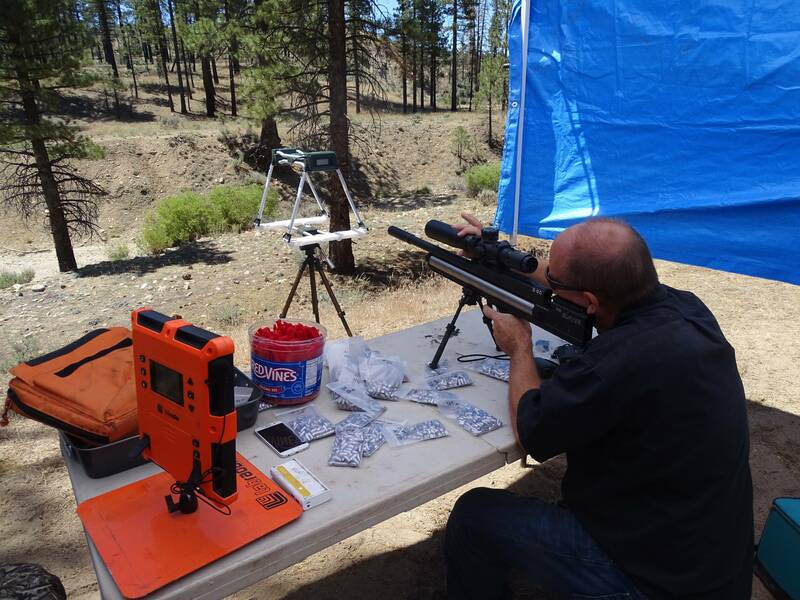 Dana was using a .22 cal Hatsan that was sent to him for evaluation and I was using a new 22 cal American Air Arms EVOL testing some new parts and a new configuration of the rifle. The Jackrabbit got a way but Dana soon bagged a cotton tail that was hiding from predators in a small crevasse in a large rock outcropping. I scouted the area, spotted a few jackrabbits, but did not get a shot opportunity although I did formulate my plan for the next morning. The day was gone so Dana and I enjoyed an nice campfire and turned in. I started my walk just after sunrise and within minutes spotted a large jackrabbit hiding in the shadows behind a bush. I ranged him at 80 yards and took my shot. Having a new gun and very little trigger time on it, I decided to make the shot for the vitals; this was a mistake as the 18gr JSB didn’t have the power to put him down. 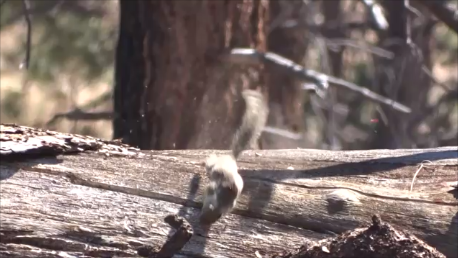 Even though the pellet hit with a large thud, he still ran like nothing hit him. I spent a few minutes following the blood trail but never found the Jackrabbit. I have become accustomed to much larger and more powerful calibers that the thought of a .22 in the boiler room not being adequate never crossed my mind. It wasn’t long before I spotted a cottontail hiding in the shadows of a large boulder. I took my time, ranged him at 79 yards and made a perfect head-shot; he rolled over and that was all. I bagged my cotton tail and followed a small arroyo for what seemed to be about an hour when I spotted a nice jackrabbit tucked in between two bushes. For a moment, I reflected on the thought that the jackrabbit thought he was invisible, not realizing his form was very distinctive even though his color blended perfectly with the surroundings. I have found there are only two ways of spotting jackrabbits – their motion or their form; with the latter having much better odds of success. I worked my way to a rock outcropping where I would have cover and some height over my prey, ranged him at 76 yards, added 1 mil of holdover and made a perfect head-shot. The jackrabbit was finished; the incredible acrobatics that followed were nothing but lost electrical signals of the nervous system on display. Within a few minutes Dana wandered into view with Marley, I bagged my prize and headed back to camp and Dana joined me shortly with several jacks he had taken with his EVOL 30. 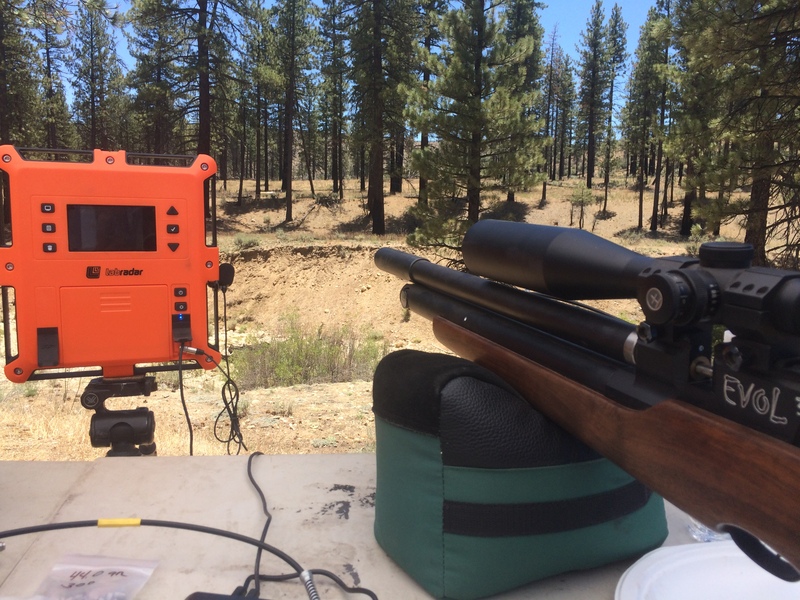 It was about noon and I was planning on leaving in a few hours but I did want to test some Nielsen Specialty Ammo in the EVOL 22. I set up some eggs at 50 yards, Dana and I hitting them with the 21 grain NSA slug was no challenge so put I some more at 150 yards. After experimenting with the holdover by shooting at a dirt patch at the same yardage, I was able to figure the hold over and dial into my scope. Hitting eggs at 150 yards with a 30 fpe .22 is not easy but I did manage to get some before I ran out of air. Here is the video that includes a good portion of footage from our adventures here. Please help us by taking a second to hit SUBSCRIBE. Thursday evening I came home from work and started packing the Jeep for a three day long hunt in the high desert of California. The plan was for me to meet with Jon, a gentleman I had met on the popular SCHOUTDOORS forum and who had volunteered to help me with some filming. The next morning Marley and I left the house bright and early for the several hour drive into the desert where we would meet Jon and have him follow us up through the rugged terrain to our hunting spot. Thankfully when we arrived it wasn’t as windy as I had anticipated as well as being much cooler than planned. As we drove into the camping area Marley and I had already spotted several Cottontails as well as some Jackrabbits and Ground Squirrels. This area is very unique as it offers a wide variety of animals to hunt, all within walking distance. We unpacked our gear, relaxed for a bit and then started setting up the camera equipment, guns etc, for a short hunt where I would show Jon the lay of the land. Jon had never used an Airgun before and was primarily used to firearms as well as a compound bow. I offered him to use my custom MK1 .22 carbine pistol that was near perfect for this type of hunting and accurate enough to make shots out past 60 yards. Jon was excited and within several minutes from camp we decided to sit down under one of the many Oak trees that nestles among the large valley with many rock outcroppings and fallen trees, the best natural habitat for the California Ground Squirrel. Within several minutes of sitting I had spotted a good size adult Ground Squirrel sunning himself atop a large boulder at 63 yards. I took aim while Jon maneuvered the camera that we had mounted on a tripod to film the action. 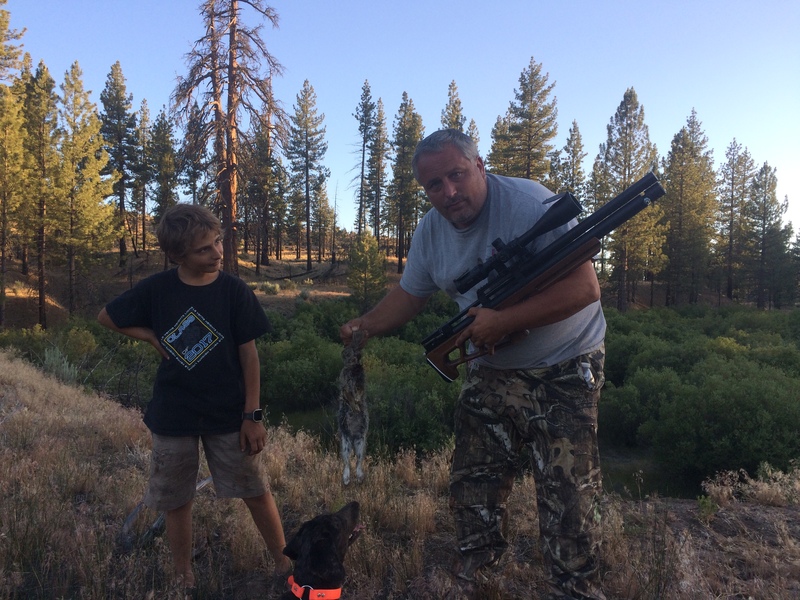 After I had made the kill on the Ground Squirrel Jon spotted a Cottontail grazing in some grass just under another Oak tree at 45 yards, Jon was able to make a nice head-shot making it his first rabbit kill and his first time using an Airgun. 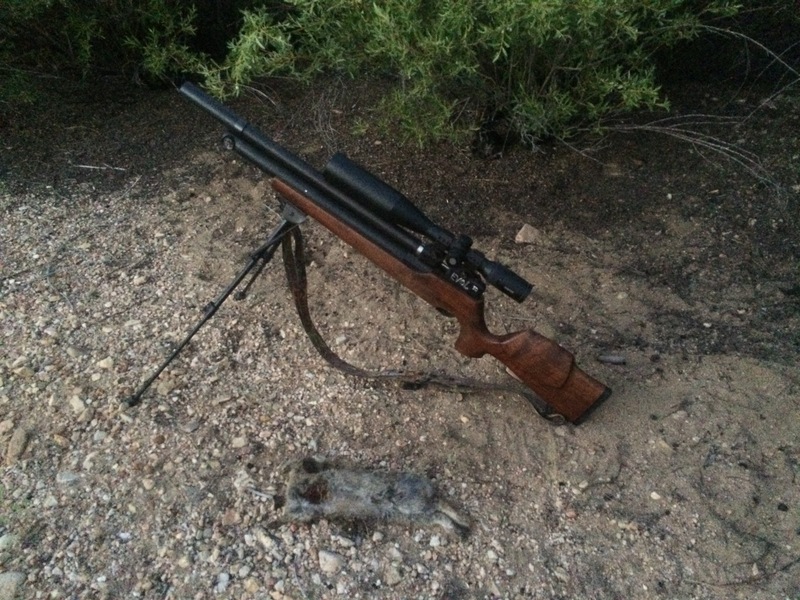 As we moved our locations we spotted another Cottontail that was grazing further up the hill at 40 yards where I was able to dispatch with authority using the .30 American Air Arms EVOL. After a short trip back to camp where Jon decided to pick up his compound bow and some more water for our walk down the hill we set out again. Over the next 20 minutes Jon, Marley and I walked down through the valley that followed a small creek with embankments that many Cottontails like to graze at. The grass near the creek is a bit greener as well as having a bit more cover for them to scurry into in the event they are attacked by predators. As we walked slowly down through a wooded area following a game trail I soon spotted a Cottontail at about 25 yards, perfect range for Jon’s bow. The arrows he was using were fitted with a large blunt tip that in turn is suppose to simply knock out the rabbit and not penetrate, this one passed through the entire rabbit. As Jon was collecting his kill we spotted another Cottontail that was heading up a hillside towards a large rock outcropping. 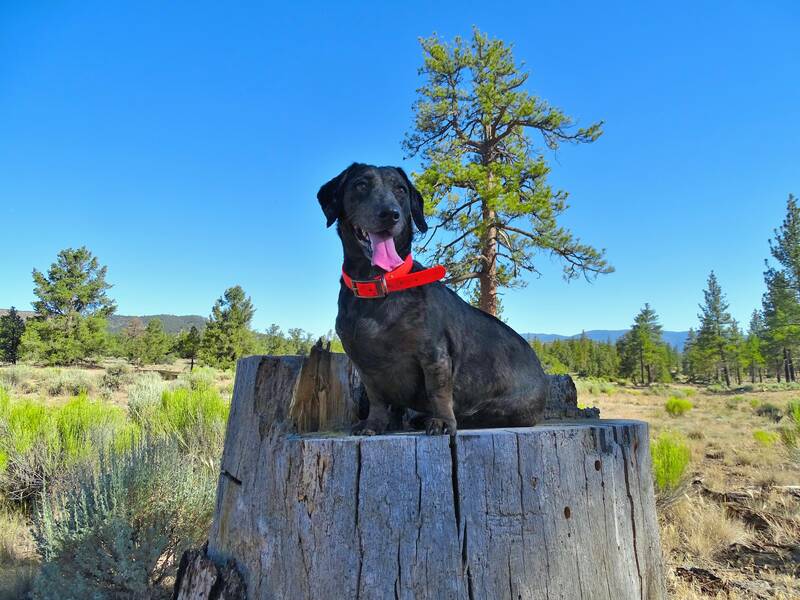 I was able to make a nice kill at 64 yards that dropped the rabbit just before it disappeared under some rocks, Marley was fast to assist in the recovery. As we continued down the creek-side into an area that was a bit more open, almost like a field we spotted another Cottontail grazing. The position of the sun gave Jon a great silhouette to make sight on at what looked to be near 45 yards, impressive with a bow. Jon and I continued a giant loop that lead us back onto a road that headed North up a hill and back to camp, by this time it was getting very hot. We made our return to camp where we were happily greeted by Nick, his wife Jessica and three boys. 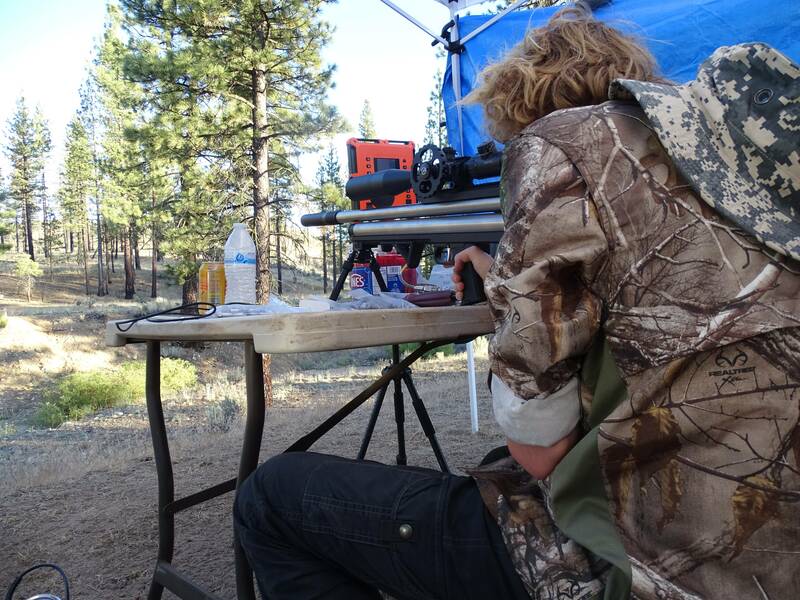 Nick was busy sighting in a few of his rifles and putting the final test on several lines of ammo he has produced. 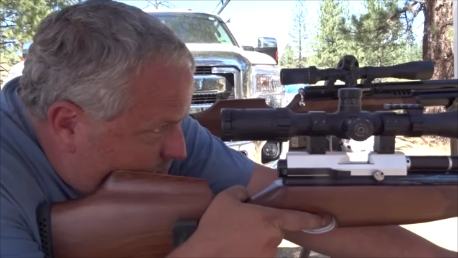 The one thing I really admire about Nick is his drive for perfection in producing a quality product, he spends hours testing his ammo and is always open to suggestion. Over the next few hours we all relaxed at camp and enjoyed the shade and luxuries such as ice cold water, food and snacks. Jessica his wife was amazing and pretty much fed us all the entire weekend! It was a great fellowship we had and I much enjoyed hanging with Nicks youngest son Josh who did join us on several hunts throughout the weekend. After several hours of relaxing in the shade I suggested that we take two vehicles and head down the hill several miles to the Jackrabbit hunting area. 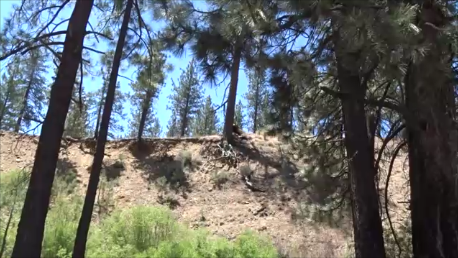 This area is huge and offers a wide variety of terrain to hunt in, flat areas, rolling hills and steep mountains. 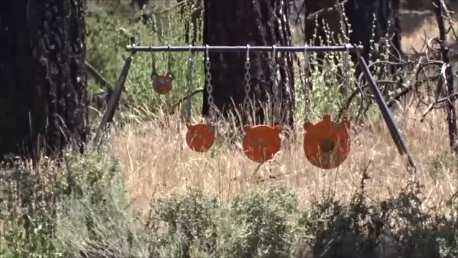 When Airgun hunting where we are trying to keep our ranges fairly close, similar as to what a bowhunter needs. After witnessing Jon’s several kills with a bow I was was excited to see what he was capable of in a more open environment. After parking our vehicles and unpacking our gear we headed East towards the mountains, I usually do this in late afternoon where I walk several miles away from the sun and then turn back into it. By doing this I can usually spot the amber ears of the Jackrabbits that are brightly back-lite by the sun. As we all made our way East spread about 100 yards apart I was able to spot several Jackrabbits moving through the thicker bushes and tall luminous Joshua trees. As I looked over I could occasionally spot the other guys taking shots on the many Jackrabbits that call this area home. As I walked I much enjoyed being here, this area is absolutely beautiful and in ways I almost felt like I had been transported back in time to the wild west. The look and feel of this location is unlike any other desert I have visited, amazing how the plants and animals can sustain such a dry climate. As Marley and I continued our slow walk, stopping every few steps to glass for movement I spotted several Jackrabbits at 75 yards in front of us between two Joshua trees. These two had frozen like statues and were near invisible with the perfect camouflage they wore. I had the EVOL .30 loaded with the 44gr Predator International Polymags that I have concluded are just about the best ammo for this type of hunting. They feature a polymer tip in the head of the pellet which implodes into the rest of the pellet, making for a devastating impact. This pellet is also lighter due to its polymer tip that in turn shoots a bit faster, these are not as great for super long range but out to 120+ yards they work very well. Jon and I continued our walk where we eventually turned around to head into the sun hoping to spot the illusive amber ears, the evening was just breathtakingly beautiful. As we walked a bit more Jon had suggested that I stay put and he would continue in a short half circle direction hoping to flush several Jackrabbits my direction. Several minutes went by and sure enough I had a smaller Jackrabbit moving its way casually right towards Marley and I by about 65 yards. I was able to make a nice clean chest shot that sent the Jackrabbit into a back-flip where Marley was quick to make her retrieval. As we made our way back to the Jeep we had noticed that our second party had left us, figured it may have been to hot or they simply had gotten to many or not enough. I was very pleased with our short little hunt that turned out to be very action packed and successful, too the footage I had gotten of Jon stalking a Jackrabbit was spectacular. As we packed up the truck I took several more photographs and we headed back to camp excited to hear how the others did. 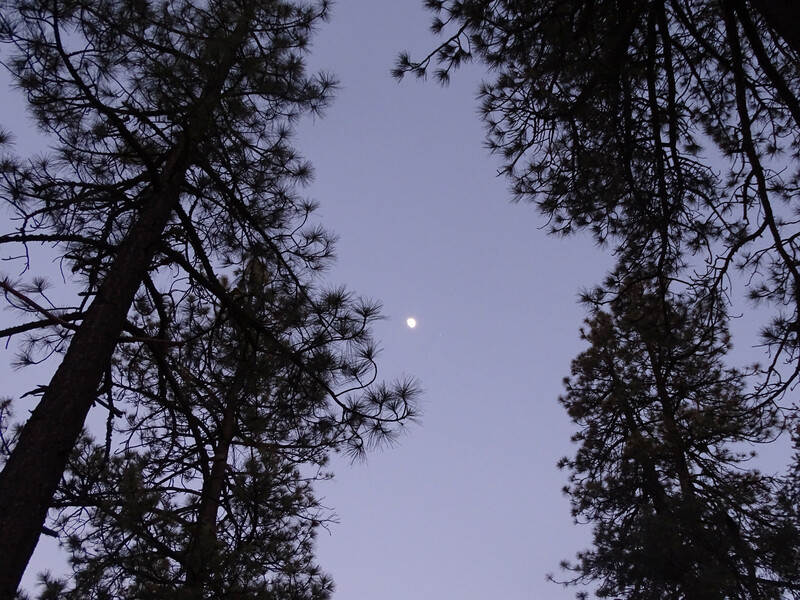 The evening was nice and cool and offered some spectacular views of the stars, Nick, Jon and I stayed up late and talked for a bit with Jon and I deciding to call it a night as we planned to get up early and hunt. This morning we awoke just after sunup and decided to follow the creek down through camp and cross the road where I had previously scouted for Cottontail the day before. 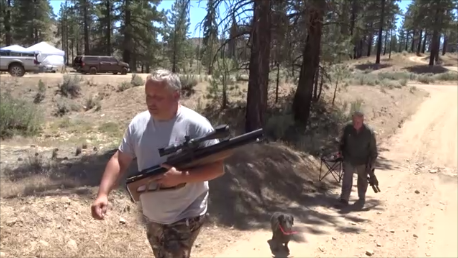 We had been expecting Tom Costan from American Air Arms to arrive that morning so had planned to stay fairly close to the road so that we could hear his arrival. As we made way down the creek Jon and I had spotted several Cottontail that disappeared into the treeline and out of sight into the thicker bushes. This area was loaded with rabbits, no doubt one of the best habitats I have ever seen. We continued down the creek-side path that led us into a giant open field that gave opportunities for much longer shots. As we took a break from our hike we stopped just near the creeks embankment where I soon spotted a Cottontail moving around next to a large bush at 115 yards. I set up the rifles bi-pod and took my shot that sent the rabbit into a backwards flip leaving a loud crack that echoed through the canyon. 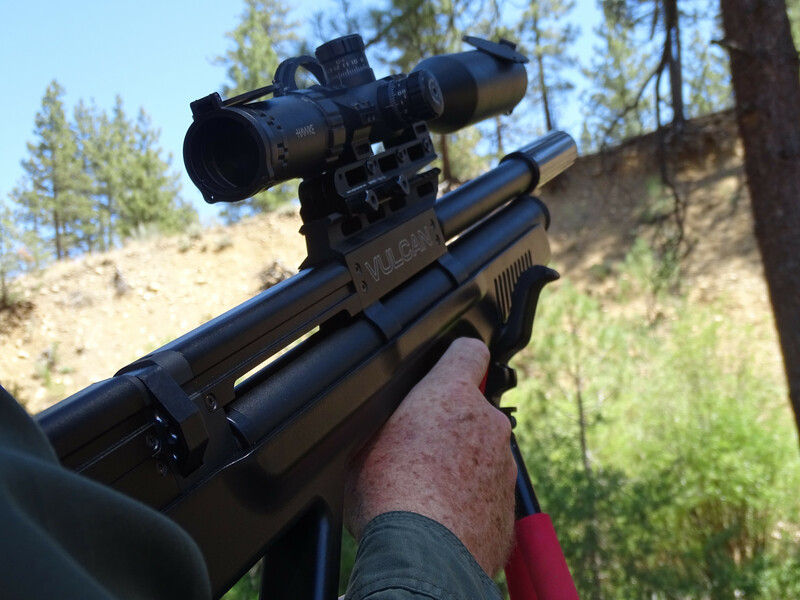 After this photograph was taken we heard the distant crack of a Big Bore Airgun in the distance, figured it was Tom Costan from American Air Arms making his way into the field with his .357 Slayer. Soon enough Tom made his way down through the tall dry grass and across the creek to where we were posting up. Tom was excited when we told him of the success we had that morning and was eager to accompany us on our hunt further out into the hills. We now headed Eastward where a large many Conifer trees were, Cottontails usually frequent the base of these areas and offer good opportunities. Tom was able to make a shot on one Cottontail at close to 75 yards that came in a bit low sending the rabbit on the run and into the thicker areas of bushes where we lost sight of it. 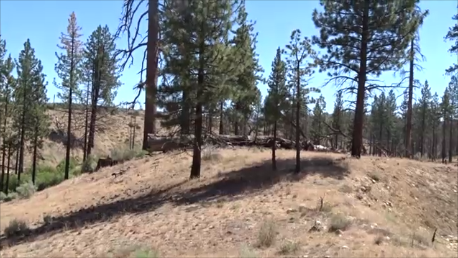 This area made way past several of these large trees and then into a more open area with Oak trees and scattered rocks. Jon spotted a Cottontail moving through the grass and up into the many nearby rock outcroppings, this was a great habitat for them. After Tom had taken several shots getting after some rabbits he made a quick refill with his buddy bottle with a little help from Marley. As he was refilling I had noticed Jon stalking a rabbit so Tom and I decided to quietly continue down the path where we split up a ways so I could photograph. Tom headed up into the mountains that offered him further shots and was soon to spot several ground squirrels sunning themselves on the many rocks that scattered the area. 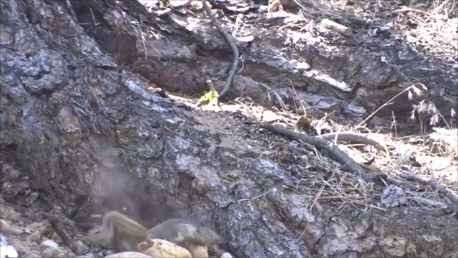 As he made his way through the rocks he made a beautiful 85 yard head-shot on a ground squirrel that left quite the mess on the rocks using 120gr Nielsen Specialty Ammo Swaged slug. As we hiked further into the mountains we took a rest under a large Oak tree that offered shad and a great location to spot animals moving in the distance. By this time it was late morning and the heat of the sun was starting to beat down on us pretty hard, especially Marley. We rested for about 20 minutes while glassing the vast valley for any visible movement, very little mount of activity other than birds as it was simply by this time to hot. We all stuck fairly close together on the way back as we headed down the other side of the mountain where we followed a trail that ultimately would return us to camp. As we made our way back I could see several rabbits in the distance scurrying in several directions, one made its way right in front of Tom at 40 yards where he was able to take it out even considering a small bush was in his way. After lunch we headed down the hill where we had planned to do some long range shooting with the Slayer as well as some photography work I was doing with several other products. 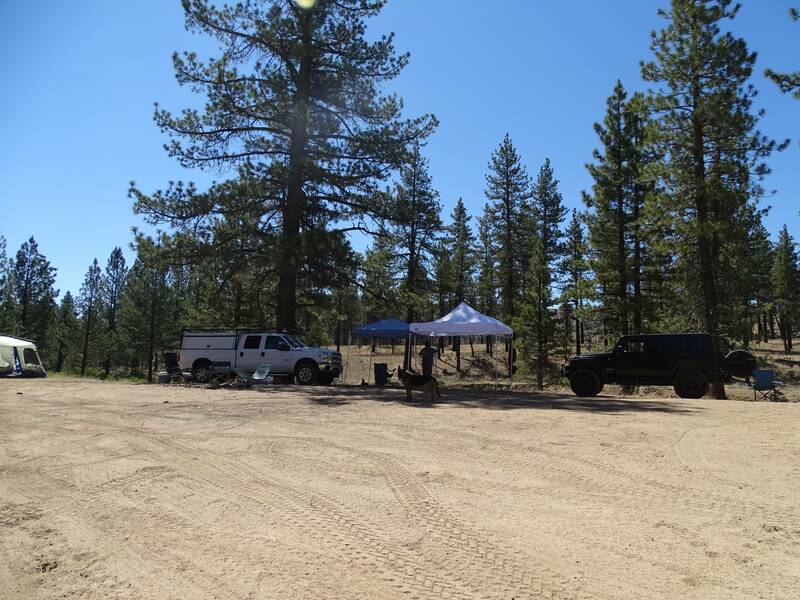 The area we drove to was only several miles down the road and offered a nice shaded area to park as well as ranges out to several hundred yards. 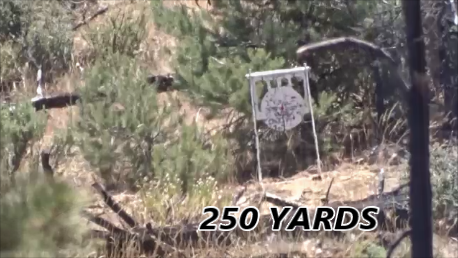 We had set up a soda can at 100 yards, eggs at 175 yards and a 3″ spinner at 250 yards that offered all of us some good challenges, especially in the wind. Tom was first to make some shots and make it look easy with the .357 Slayer, well he should have considering he built the entire gun from the ground up. The eggs were by no means easy in the wind, luckily Jon had brought his high end spotting scope that helped very much in identifying the shots. 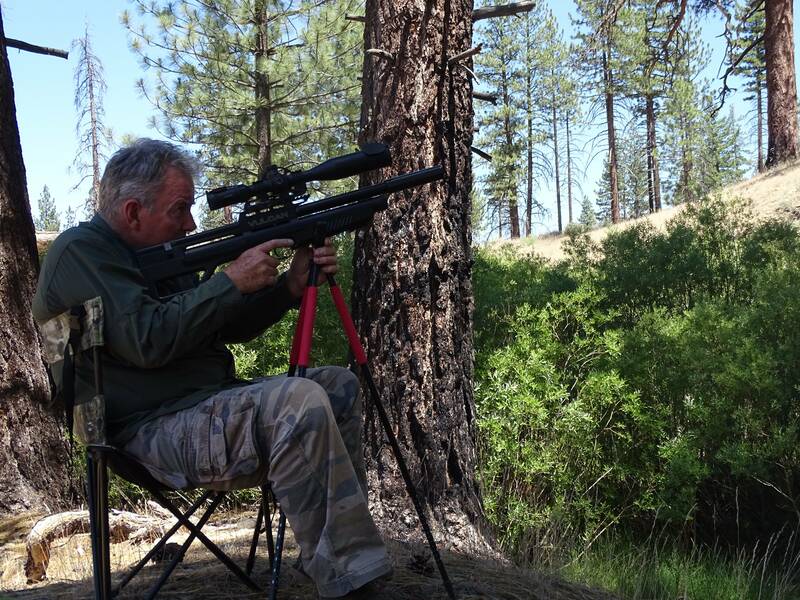 After annihilating a bunch of eggs Tom turned his sights on a very challenging 3″ spinner that was set out at 250 yards, pretty hard to see at that distance. Both Tom and I took turns with the gun and with some practice were able to consistently make hits, even in the wind that was swirling at times. His Valdada IOR Recon 4-28X50 scope is a beast and one of the nicest long range scopes I have used, perfect match for the Slayer. 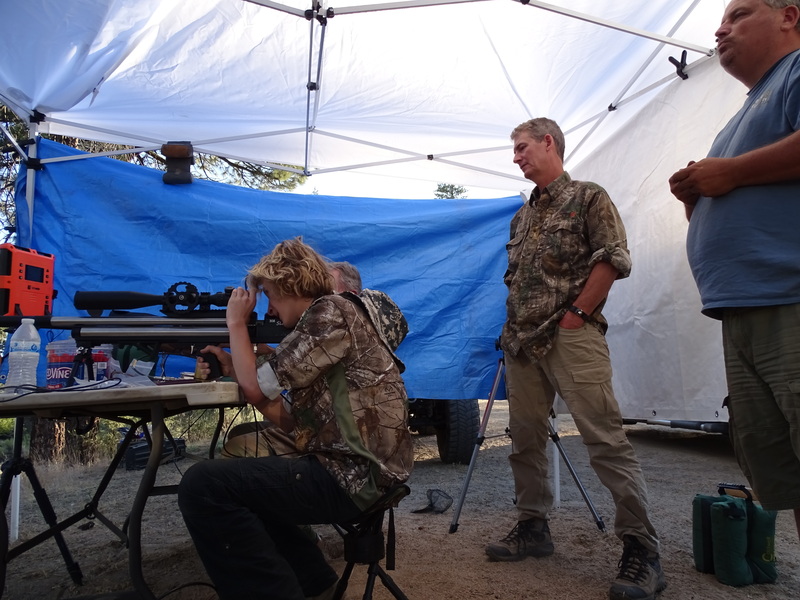 We all had a great time shooting, John even had brought his .22 rifle that he had a great time shooting. As the guys continued shooting I decided to set up the Kalibr Cricket .25 bullpup with the new Side-Shot phone mount that’s a great new product that allows you to shoulder the rifle like normal and look through scope while still recording. The kit comes with 1 complete Side-Shot, 1 Scope clamp of your choice (3 scope clamps are in the picture to show different sizes, comes with 1 clamp) in 1 inch (25mm), 30mm or 34mm size (to fit scope tube size) and 1 stabilizer bar (plastic piece that snaps onto your scope and dampens vibrations) Side-Shot is a universal phone adapter that holds your smart phone securely and adjusts to different phone sizes and brands so you don’t have to keep buying more holders each time you get a new phone. Its quick change system lets you switch from one gun to the next in seconds. This Kalibr Cricket .25 bullpup is set up to shoot .25 38gr NSA slugs at near 880 fps making this gun quite the hammer. I was setting up this gun to use for my hunt that afternoon and evening, hoping to capture some action on video. This is the first time I had really ever used any type of scope-cam and was very pleased with how easily everything went together. After I set the gun up I set out into the nearby field and immediately spotted several Jackrabbits. The cant was a bit off adjustment but I can see with a bit more time in fine tuning this may be the ultimate setup for recording. I spotted several Jackrabbits and most were on the run after they spotted Marley, she chased a few after I had taken several shots. These Jackrabbits are amazingly fast, especially out in the open as they were here. I much enjoyed playing back the action on my phone and can see I will be using much more of the Side-Shot on future hunts. I think its really good for me because I can easily record and send to email, Facebook or even directly to YouTube. 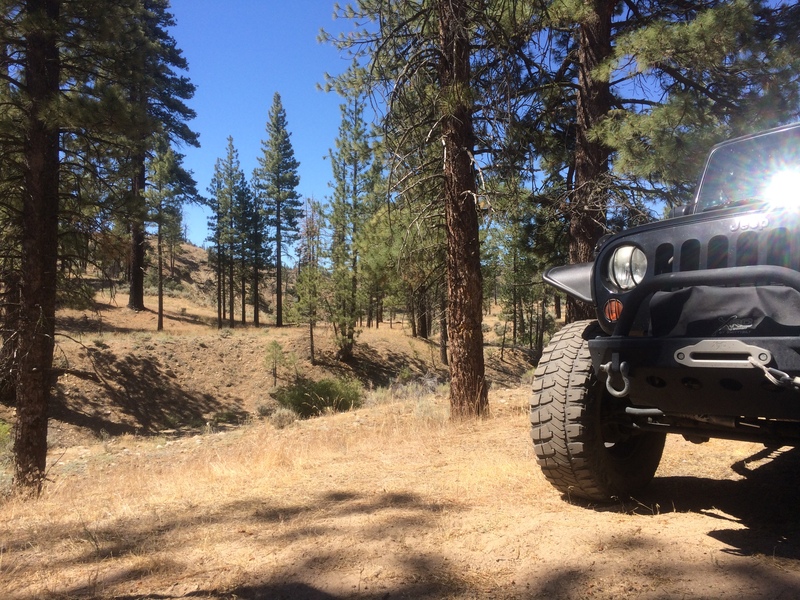 After making some very unsuccessful shots in the extreme heat of the day Marley and I made way back to the Jeep for some water and to join the other guys for our continued long range activities. We all had a great time and felt a little more confident with our shooting skills after the several hours spent practicing, the 250 yard spinner was a ton of fun and really shows what Airguns are really capable of. The footage we got was impressive! We loaded up the vehicles and headed back to camp where we really just sat and relaxed until about 5:00pm when it started cooling down a bit, the high for the day was 112 degrees, much to hot to be out hunting. As we drove down the hill the plan was to follow a small Jeep trail that headed East up into a very remote part of this desert. I had previously found the area on Google Earth and had noticed it being a little greener that may have indicated some sort of water source. Tom took off up into the valley a bit ahead of us where he soon made a beautiful 105 yard shot on a good size Jackrabbit, you can see in the photo just how close the Jackrabbits fur matches the ground cover. Jon, Marley and I continued several hundred yards next to Tom following the many animal trails that were covered in tracks, this area was very active. We made our way into a field that seemed much greener just as I had seen on Google Earth and almost immediately spotted several Jackrabbits. I set my sights on one at 75 yards that had froze like a statue next to several bushes just long enough to make a great shoulder shot. The .25 Cricket is a great bullpup for offhand shooting and has a ton of power to push the NSA 38gr slugs nice and flat for longer range shots. As we continued our hike through the desert Tom continued his own busy hunt and even managed to get a very large Jackrabbit at 90 yards with a spine shot that dropped that jack on the spot. Jon and I moved a bit further away from each other and I moved towards a strange area that had some sandstone hills with more open terrain with very little vegetation. I saw something out of the corner of my eye like a flash of something big moving, as I looked again I noticed it was a very large Coyote, unlike others I had seen this one almost had more of a winter coat. I tried getting my scope on it and was able to capture some on film but unfortunately it was moving way to fast to take any successful shots. I was caught a bit off guard by the sighting and was a bit disappointing that I had not had a better chance. As the sun moved down a bit more I was starting to see more and more Jackrabbits moving about through the bushes and sandy washes. Marley and I continued to follow the sunset in a slow walk down the sandy wash that led us to an opening where I spotted a good size Jackrabbit sitting next to a Cholla Cactus. I had a nice clear shot at 87 yards that I placed right in the head that sent the Jackrabbit flipping backwards where Marley was able to make a quick retrieval. Over the rest of the evening we continued to see several large Jackrabbits but I think between all the foot-traffic they had become very aware of our presence in the desert. As we continued back and made our way to the vehicles Marley had spotted a Jackrabbit and gave it a pretty good chase, amazing how fast that little dog is when she is motivated. Over just the past two days she had gotten more action than any other hunting trip I can remember, near 20 rabbits between all of us. We took a break by the Jeep soon accompanied by Tom who had to say his goodbyes and head back home, what a great day we all had. That evening back at camp Nick BBQ some burgers and we had a great time hanging out and reminiscing the great day we had. It was 4:15am and Marley, Jon and I awoke very early to head into an area I call “The Hills Have Eyes” a very desolate location that offers extreme long range shots. I had hunted here several times before with Tom and we had both always had great luck finding Jackrabbits and Cottontails. The area we parked was near a trail that wrapped around the base of a mountain that overlooked several miles onto the desert floor. It was barley light out by the time we started our long hike that’s terrain can be very unforgiving and rocky. As we made way over the first rise I spotted a Cottontail at 83 yards in the open that gave me opportunity to make an excellent head-shot. Jon set up his GoPro camera to capture some time-lapse video that we planned to use in the video of this adventure. The morning was fairly quiet other than the distant chatter of a Coyote caller that someone had set out several miles down on the desert floor followed by several large caliber shots followed by silence. As the sun started to come up over the mountains Jon and I were starting to spot several Jackrabbits moving about, most way beyond 200 yards. I knew most of the shots here may beyond what the Cricket was capable of but still was excited to see what Jon could do with his .22 rim-fire as I knew he had much practice with it the day before. 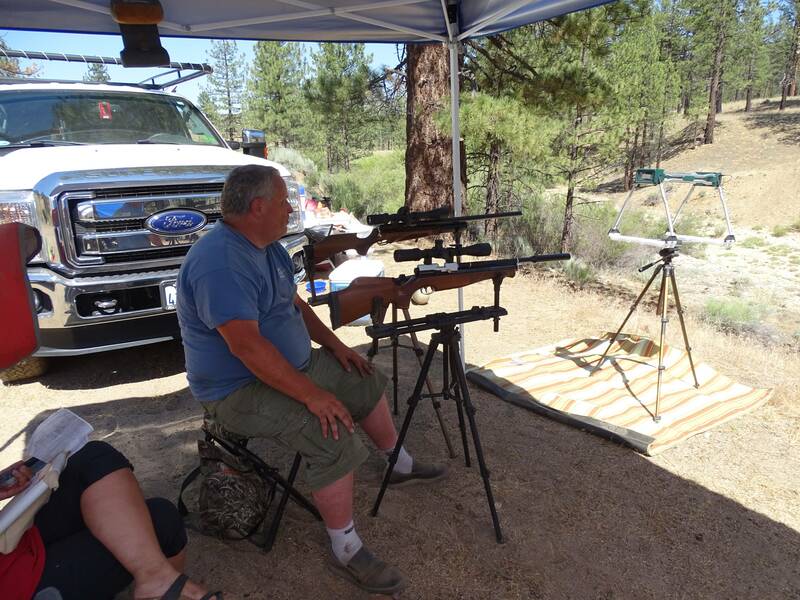 Jon set up his rifle into his tripod that would assist him in making some shots that were out to 300 yards, amazing for almost any type of rifle. We had spotted several Jackrabbits moving, some were simply lost due to the extreme distance and difficulty to track through the scope with so many bushes, trees etc,. After some patience Jon finally settled in on a Jackrabbit that I believe was just beyond 300 yards sitting next to a bush offering not much more than a sharp black silhouette as a target. As you can see from the photograph this is an extreme long range shot and very similar as to what we were doing with the Slayer in a previous video we did. I manned the camera and even with a tripod and the friction head cinched down it was still difficult to keep still at these ranges. After a few minutes of setting everything up Jon took the shot that through a video review took several seconds for it to reach out the 300 yards where it fell just short and to the left by about 8″, still impressive shooting as far as he was. As it was now approaching 9:30am it was time for us to make our way back to the Jeep and make our way back to camp to start packing for the trip home. As we made way through the mountains and more nearing the vehicle we spotted several Cottontail, one of which we both took shots at with no luck of recovery, even by Marley. 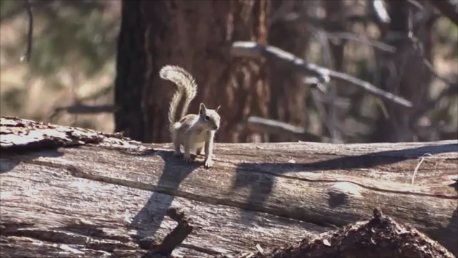 As we made out of the mountains and back to the Jeep Jon had spotted several Ground Squirrels that were sitting upon a huge boulder high above us. 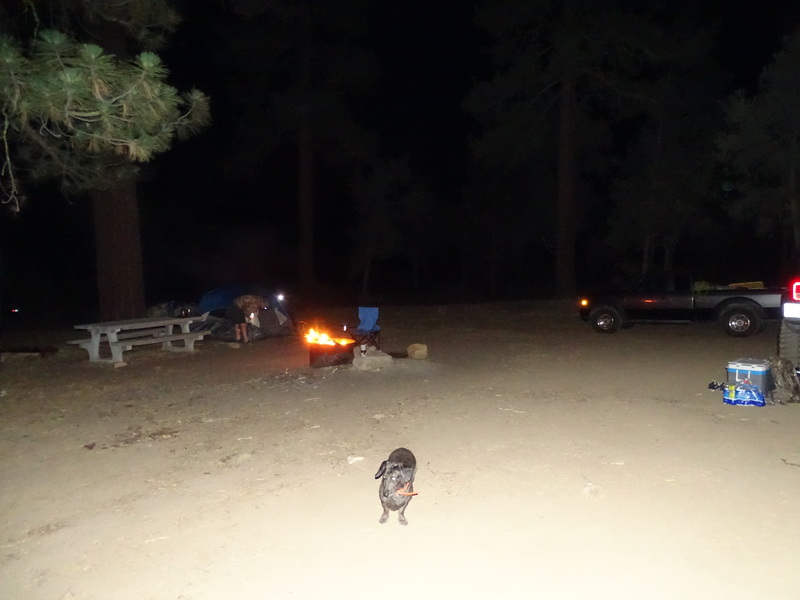 With very little energy left to sit and wait for the Ground Squirrels to come back up we decided to call it a day and make our way back to pack up all our camping stuff and head back home. Over the three days we had taken many Cottontails, Jackrabbits, Ground Squirrels and even had a short encounter with a Coyote. For me this one simply just one of the best hunting trips I had had in a great many years and was so happy that everyone had such a great time. I learned a few new things and got to make a new friend out of the whole adventure. Marley and I said our goodbyes and headed down the long desert road left with the exhaustion and memories of another great adventure together. I want to thank Jon for his amazing photography and video work, Nick for his great company and allowing me to use his Cricket coupled with his NSA ammo that worked flawlessly throughout the hunt. I want to thank Tom for coming out and hunting with us and allowing us to do some long range shooting with his .357 Slayer. Over the next few months we plan on doing some more trips and as usual will try our best to bring all the action through video and photos. Enclosed is a video link of our three day hunt I hope you can enjoy. If you can help us by SUBSCRIBING to our channel it’s much helpful, Thanks! Well, to be honest, my original intention for this article, was to write a simple tutorial on how to properly field dress a Rabbit. That changed while I was in the process of dressing this Rabbit, to an even more important subject,… that I will share with you all here. I have always heard that it is not a good idea to eat Wild Rabbit during the warmer months of late Spring through early Winter. (May, June, July, August). But depending on your location and typical weather, (especially in warmer climates such as we have here in southern California), we should also toss in September, and possibly October too. The idea behind this, is that most Parasites are either dormant or die off in the cold winter months, and in area’s that have snow, it is believed the Parasites do not survive “After the first Good Freeze”. (Here in Southern California, we rarely get snow below 4000′ elevation) I suppose these old sayings of “Months without an R”, or “After the first Good Freeze” are not really hard line RULES,…but it brings us to the point of this article. That point is, ALWAYS thoroughly inspect your kills, and Be Mindful of any Unhealthy Game. We are now in the warmer months, and all the bugs, creepy crawlers, parasites are most active now. So it is important to keep in mind, pay attention, and closely inspect any kills you intend to eat. I took this rabbit yesterday in San Bernadino County on one of my permissions. I was dressing it out, and taking pics with the intention of presenting a “How To Dress Out a Rabbit”. I was going to include step by step instruction with each pic, but we’ll do that some other time, with a healthy and safe to eat game animal. The priority for this article changed when I noticed this on the cutting board of my dressing table. What the heck is that thing ? and Why is it moving ? I wont be making any Rabbit Stew with this weeks bunny, and we can just toss it out for the Coyotes to feed on. (haven’t seen many of those on the permission lately), but we Did have one walk right out in front of us at only 50 yds a couple of weeks ago. Wouldn’t you know it, I hadn’t even taken my rifle out of the truck yet, and the Coyote seemed to know that, since he was in no hurry, and just slowly trotted away, straight down our target shooting lane. GRrrrrrrr ! This also warrants a mention to those of you hunting Coyotes, … as they are fraught full of Fleas, Ticks, Deer-flies, and who knows what else right now. These critters can infect both your game, and/or You too. So BE CAREFUL,… and use proper protection, if you plan on handling any kills during this time of year. They can carry a whole list of diseases one of which is Tularemia. So do your homework, and be properly prepared. Check your clothing often, check yourself and or your kids, pets, etc, after being in the field. stage of development. The warble is typically oblong. The larva will cut a hole in the top of the warble forming a darker spot (warble pore) to breathe through, then uses it’s mouth hooks to secure itself. 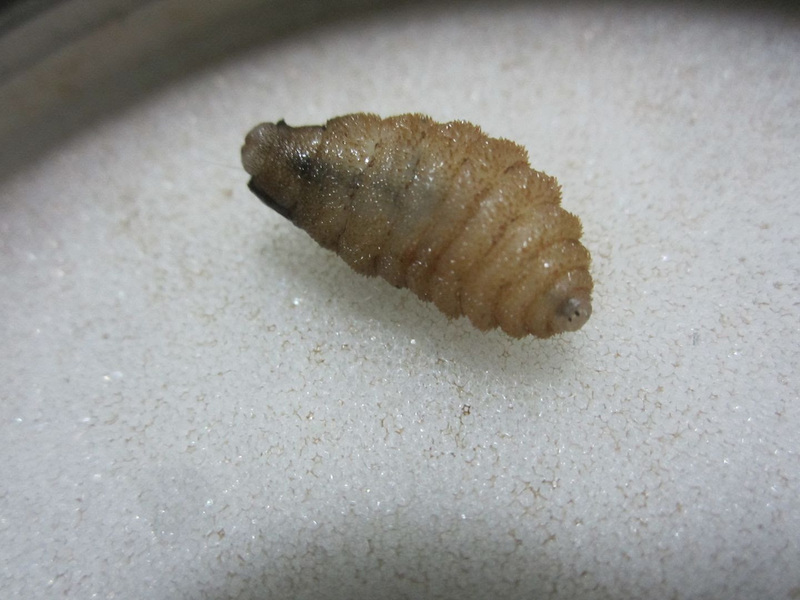 The Bot Fly larvae uses its warble much like other insects would use a cocoon to develop. It does not in fact digest the hosts live tissue, but digests the tissue exudate (secretions) of the host. As the warble grows with the maturing larvae the warble may occasionally be mistaken for an abscess. While unnerving and disgusting, it is rarely fatal, and once mature the larvae will crawl from its warble, fall from the host and develop into its pupae form in the soil. It causes no more than mild irritation to the host. More than one warble may form at a time. The danger in Bot Fly infestation is the likely-hood of infection at the warble site. 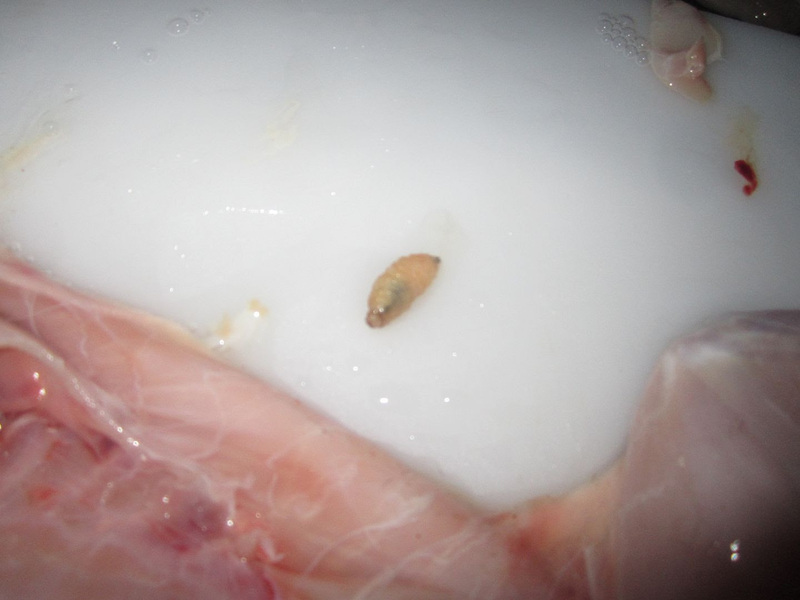 We don’t recommend trying to remove Bot Fly larvae on your own and recommend the bunn be brought to a veterinarian. If the larvae is crushed in the removal process it can cause an anaphalactic (severe allergic) reaction leading to the death of the bunn. A vet is better equipped to fascilitate its removal. a lump with missing fur from animal scratching at site. the warble protrudes prominantly from the animals body. the tip of the warble, the spiracle through which the larvae breathes is visible. discharge, blood, pus or a browish material. 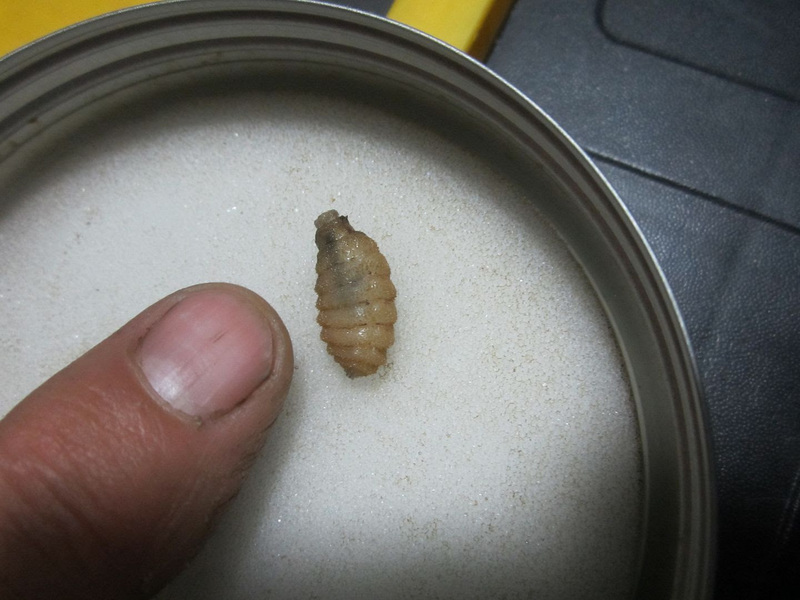 By week 3-4, the larvae matures and drops to the ground to pupate. The animal is left with a hole where the larvae was living. Most of the time the wounds will heal requiring no treatment. However, at times these pockets may become infected and require treatment. The animal heals and there is little evidence of warble infestation. Tularemia is an illness caused by a bacteria, Francisella tularensis, which can affect both animals and humans. Most cases occur during the summer months when deer-flies and ticks are abundant and the early winter months during rabbit hunting season. During hunting season, illness usually results from skinning infected rabbits. Anyone can get tularemia if they spend time outdoors in areas where infected animals, deer-flies or ticks, can be found. 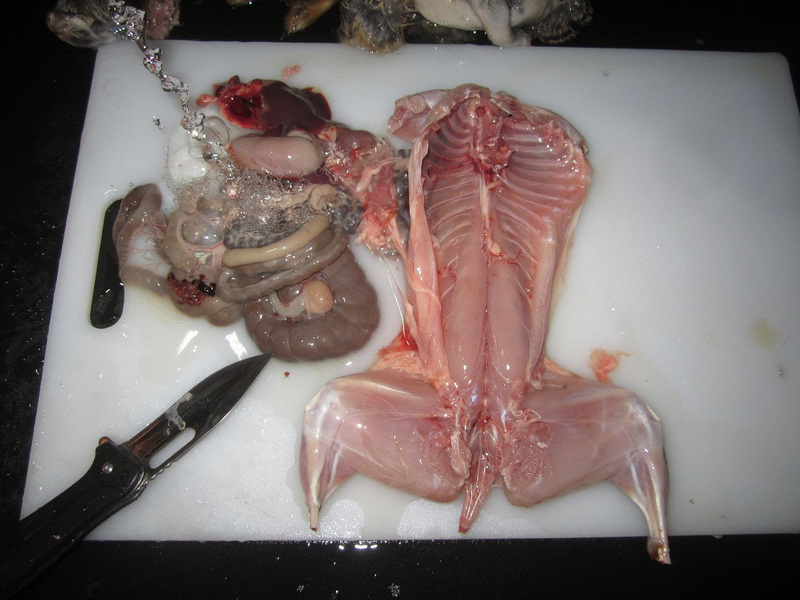 Rabbit hunters, trappers, and laboratory workers exposed to the bacteria are at higher risk. The most common way tularemia is spread is by the bite of an infected blood sucking insect such as a deer-fly or tick. Another way people get tularemia is by getting blood or tissue from infected animals (especially rabbits) in their eyes, mouth, or in cuts or scratches on the skin. 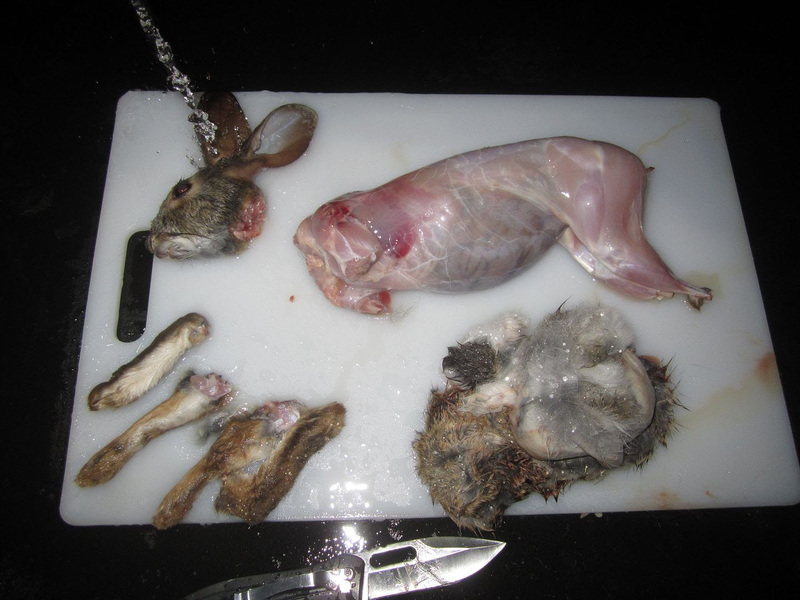 Tularemia can also be spread by handling or eating rabbit meat that is not cooked well. Drinking contaminated water or breathing dust containing the bacteria can also spread tularemia. Person to person spread does not occur. The usual symptoms of tularemia are fever, chills, headache, muscle aches, chest pain, and coughing. If tularemia is caused by the bite of an infected insect or from bacteria entering a cut or scratch, it usually causes a skin ulcer and swollen glands. Eating or drinking food or water containing the bacteria may produce a throat infection, stomach pain, diarrhea, and vomiting. Breathing dust containing the bacteria may cause a pneumonia-like illness. Symptoms may appear between two and ten days, most often within three to five days. What is the treatment for tularemia? Antibiotics such as streptomycin and gentamicin are used to treat tularemia. What can be done to prevent the spread of tularemia? 1. Persons at risk should reduce chances for insect bites by wearing protective clothing, and by searching for ticks often and removing attached ticks immediately. Tick/insect repellents containing “DEET” provide additional protection. Permethrin is also helpful when sprayed onto clothing. 2. Children should be discouraged from handling sick or dead rabbits, or other possibly infected animals. 3. 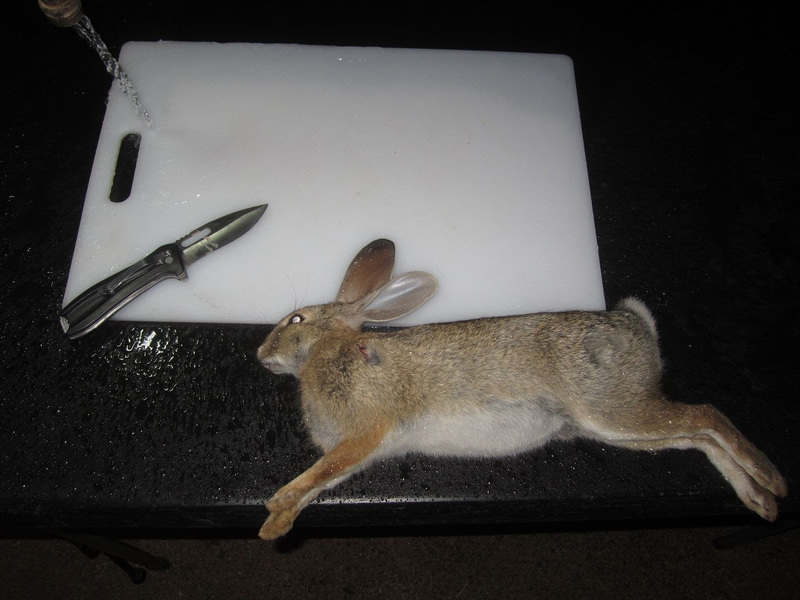 Gloves should be worn when skinning or handling animals, especially wild rabbits. 4. 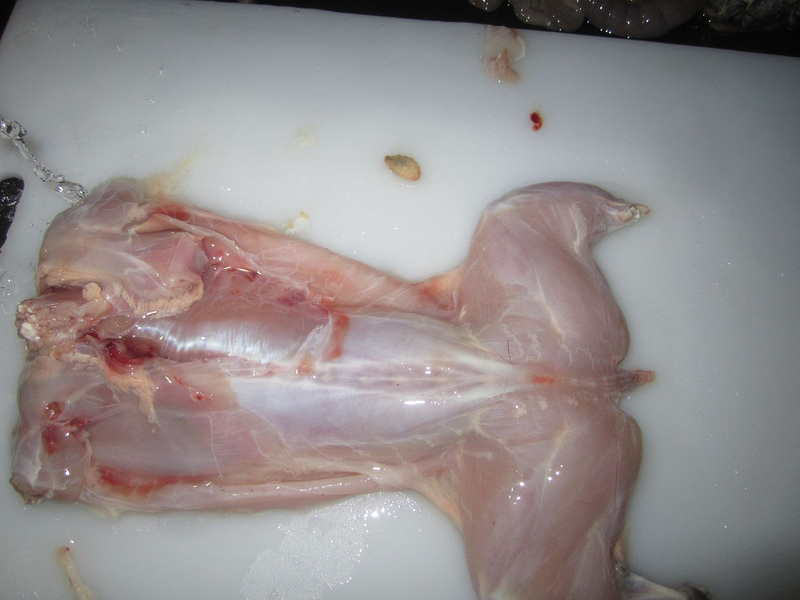 Wild rabbit meat should be thoroughly cooked. 5. Face masks, gowns, and rubber gloves should be worn by those working with cultures or infective material in a laboratory. With regard to Tularemia. 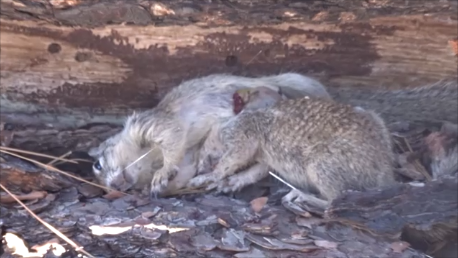 For those who hunt predators, particularly predators that (can) prey on rodents (as most do), bears, foxes, coyotes, lynx/bobcat, etc., those predators are potential for contracting tularemia. OK everyone, I hope you find this informative and a good reminder to Pay Attention out there. THINK about what you are doing…. Watch what you are preparing for your dinner table,….. and don’t get lazy, . Take care, Have fun, and Shoot safely.